At the end of each year, it’s easy to find ourselves both looking back at all that happened over the past 12 months, trying to reflect on it, and then looking forward to what’s ahead. The “what’s ahead” is about to hit us with a right-cross in a couple of weeks when CES arrives, so I’d say that I’m still very much in the reflection stage at this point. 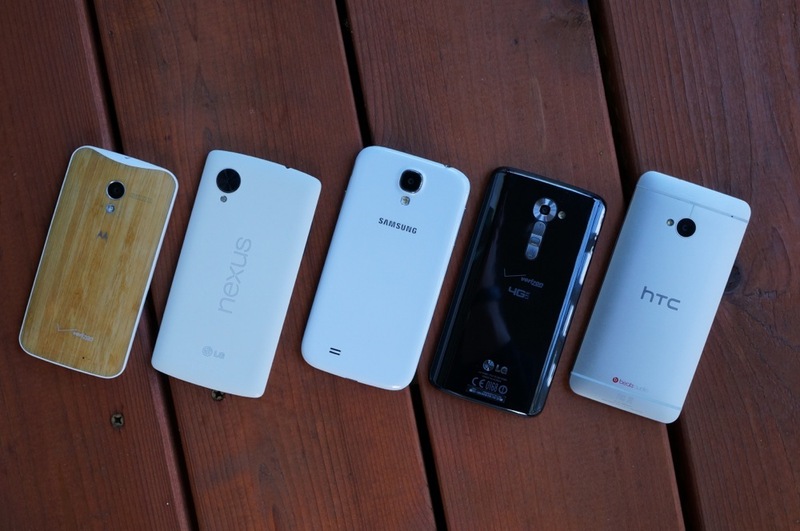 Which brings me to this post and my thoughts on the top 5 Android phones of the year. The year 2013 was filled with the most incredible smartphones the world has ever seen. 1080p displays became a standard (for the most part), cameras grew increasingly better, battery life is now measured in days instead of hours, customization was introduced, and prices may have started to decline across the board. Phone manufacturers also seem to have figured out winning formulas for the most part in terms of hardware, but only one still has the marketing side (or budget) on lock. All of that helped shape this list. And speaking of this list, it is 100% my opinion, an opinion I hope you are open to disagreeing with in the comments below. The whole point here is to spark conversation, so let’s get to it. No surprise here, right? Even though I handed the top phone award to the Nexus 5 in our last DL Show, that was mostly just to give a different answer from the across-the-board opinion of the team, which was the Moto X. Back when this phone first launched, I penned an article stating that the Moto X would be my daily phone until the next Nexus came out, because I assumed that the next Nexus would supplant it on my desk. And you know, that actually happened. The Nexus 5 arrived and I loved it for the most part, outside of a camera that would later be fixed. But the entire time, a wandering eye always seemed to focus on the Moto X, as it looked for a way to get it back into my pocket. And then Bamboo happened and it has returned, probably for good. The Moto X tops this list for many reasons, but there are two in particular that make it stand out to me: choice and Active Display. With the Moto X, you have a choice in how it looks, how much storage it has, which carrier it works on, and if it’s a developer edition. You can’t say that for any other phone on the planet. The Moto X that sits on my desk today has a one-of-a-kind Bamboo back and works on Verizon because that’s the carrier I wanted it on. But I could have gone green with yellow accents, chosen T-Mobile, and unlocked the bootloader to tinkerer to my heart’s desire. No matter what, the customization of phones is a ground-breaking idea that Motorola brought to life. I just hope they have seen enough success with it to keep it going. The other reason I can’t get enough of the Moto X is Active Display. I’ve talked about this feature a lot, but having my phone show me timely information every single time I pick-up my phone or pull it out of my pocket without having to hit a button is the single greatest software invention of the past couple of years for smartphones. I no longer have to interpret blinking LED lights or fumble over the power button thousands of times per day. Whenever I pick-up another phone to test, this is the first thing I miss. The Moto X may not have the best display or camera, but I’m willing to deal because everything else it offers I can’t live without. Just because I show constant love for the Moto X doesn’t mean that the Nexus 5 is somehow a distant 2nd place. In fact, because of its display, power, and ties to Google, it is closer than you might think. Nexus phones will always rank very high in lists like this from me because they are Google’s vision of Android, they ship open (SIM unlocked and unlockable bootloader), seem to work on more wireless frequencies each year, and sell at unbelievably low prices for the hardware involved. I gave you two major reasons why the Moto X tops this chart, but for the Nexus 5 at a close 2nd, there is one: price. At $350 off-contract, you can have a phone that works almost everywhere (just not Verizon), matches the most powerful phones available spec-for-spec, and runs the newest version of Android before anyone else has even sniffed it. Other phones that compare to the Nexus 5 all sell through carriers at almost double that price without a contract. When the Note 3 first debuted, it was selling for $299 on-contract. If you want another reason outside of price, I’d say that Google came oh-so-close to creating the perfect smartphone. With last year’s Nexus 4, Google gave us a poor camera, awful battery life, and no LTE. This year, they tried to step their game up in all of those areas with the Nexus 5, while producing a hardware design that feels and looks as good as anything on the market. Battery life is good enough and LTE is included on a variety of bands. The only issue I still have to do this day is the camera, even after its latest camera-fixing update. You were almost there, Google. If you haven’t yet, be sure to read our Nexus 5 review. Before the Moto X entered my life, I was using a Google Play Edition Galaxy S4 and loving every second of it. I 100% despise Samsung’s TouchWiz Android skin, but actually enjoyed the build of the Galaxy S4 when it was released with its svelte body that feels as good in hand as the Nexus 5. So with a GPE phone, there is no OEM skin, only 99.9% stock Android with regular updates. What’s then not to like? With the Galaxy S4, Samsung packed in best-of-the-best specs, an amazing mobile camera, and probably 2013’s best smartphone display until the Note 3 came along. Couple all of that with a guarantee of updates and TouchWiz’s bloat out of the way, and you have yourselves an amazing smartphone. It really was my phone of choice from the minute it was released until Motorola handed me a white Moto X in late August. Had the Moto X not existed, it would have remained my phone until the Nexus 5 arrived. At $649 without a contract, the phone is by no means a deal. But if the Nexus 5 and Moto X aren’t fulfilling your every need, this is a great choice. I have got to admit that from the moment the LG G2 was announced to the minute I finished my review, I did not think this phone would make my top 5 list for 2013. I was so put off by the rear button placement and greasy backside, that even though it offered so many other positives, I just had to push it aside. And then one day I realized I needed to pick-up a phone to use on my Verizon line (Moto X was on AT&T at the time), so I grabbed the VZW LG G2 through a ridiculously timely Amazon discount (screw-up). Once my SIM was inserted, I immediately remembered what I’d loved about the phone and quickly looked past the two negatives. If you want the ultimate performer, I’m not sure there is a speedier or more powerful phone than the LG G2. Its touch sensitivity is the best in the game, it sports a class-leading FHD LCD panel, and probably houses my favorite smartphone camera with its insanely speedy, multi-point autofocus. Sure, it has a questionable Android skin and doesn’t yet have Android 4.4, but you know what, I’d take it any day over Samsung’s TouchWiz. LG also included useful multi-tasking tools and has dropped the price regularly since launch. The LG G2 is a great phone. If you haven’t yet, be sure to read out LG G2 review. To wrap up this short list, I’d have to go with the unlocked or developer editions of the HTC One. Not the carrier versions, I’m talking specifically about the versions sold directly through HTC’s store. These make the list because in 2013, updates rule the world. I own the unlocked HTC One, and it is already running Android 4.4 “Kit Kat.” The carrier and global models could be weeks if not months away from receiving a similar update. With no middle man, HTC has been able to update their 2013 flagship in the timeliest of manners, which Android enthusiasts like myself can appreciate. You may remember that I also claimed this was my phone of the moment at one time, that was until the GPE Galaxy S4 came along of course. But the HTC One has a lot to offer. With its amazing sound experience (BoomSound), set of specific stand-out camera tricks (Zoes and Highlights), performance with high-end specs, and all-metal body, it set a standard for 2013 smartphones that seemed to have raised the game to a new level. You’ll still find techies to this day that will claim the One as the best available phone, even with its successor a few months away and phones like the G2 and Moto X out. 2013 may have been a terrible year for HTC, but I don’t think anyone can deny the quality of the One.